Do you ever experience a buzzing or ringing in your ear, or perhaps hear a noise that you know isn't really there? That sensation is a real medical condition called tinnitus, in which people hear noise -- commonly characterized by ringing, hissing, clicking or buzzing in the ears -- but no external sound is present. It is often accompanied by hearing loss, but not always. To those who experience tinnitus, even the occasional minor flare-up can be annoying and distracting, but chronic cases can have a major impact on thought processing, sleep, concentration, and overall quality of life. "The vast majority of patients with tinnitus will not have a medical health-related complication from tinnitus," Dr. Harrison Lin, assistant professor in the Department of Otolaryngology-Head & Neck Surgery at UC Irvine Medical Center, told CBS News. "However, tinnitus can be pathologically irritating and exacerbate mental health conditions, such as anxiety disorder and depression. It can result in insomnia, generate destructive trains of thought and emotions, and have a substantially negative impact on a person's life." Lin recently conducted a study to determine how common tinnitus is in the United States. The report, published online today by JAMA Otolaryngology-Head & Neck Surgery, found that approximately one in 10 adults live with the condition. Another goal of the report was to assess the impact of tinnitus on people's lives and what kind of care, if any, those who suffer from it are receiving. In 2014, the American Academy of Otolaryngology-Head & Neck Surgery Foundation (AAO­HNSF) rigorously reviewed dozens of studies on the evaluation and treatment for tinnitus to come up with a set of guidelines for tinnitus care. Lin wanted to see how well health care providers were following them. For the latest study, Lin and his colleagues reviewed national government survey data from 2007 that included more than 75,000 adults aged 18 and older. People were asked whether or not they had experienced tinnitus in the past 12 months, and if they said yes, to rate the frequency and severity of the problem. They were also asked whether or not they discussed it with their health care provider, among other questions. Of those who reported tinnitus, 27 percent had had symptoms for longer than 15 years, and 36 percent said their symptoms were nearly constant. Some previous studies have found that between 20 and 50 percent of cases will improve or go away on their own. In terms of severity, 42 percent of participants said they considered it a small problem, while 7 percent said it was a big or very big problem. Less than half had discussed their tinnitus with a physician. When they did, the most commonly discussed treatment option was medication -- even though the AAO­HNSF advises against using drugs for tinnitus. Hearing aids, the recommended intervention, was discussed only about 9 percent of the time. "[After reviewing the available scientific data on tinnitus], the group of professionals who came up with the AAO­HNSF guidelines were pretty quick to dismiss any supplements or medications for tinnitus," Dr. Erika Woodson, medical director of the hearing implant program at Cleveland Clinic, told CBS News. "I found it interesting that in this study that surveyed what is actually going on that a lot of people are still getting those." Woodson was not involved in the study. If a patient is experiencing hearing loss along with tinnitus, hearing aids can be helpful in essentially drowning out the phantom noise, Woodson explained. If hearing is otherwise normal, there are options that can mask the annoying sound. "Actually enriching the sound with extra noise can more or less just drown out the tinnitus," she said. That can be accomplished with sound machines or personal hearing devices that can produce white noise or nature sounds. Some patients may also benefit from talk therapy. "For those with bothersome and intolerable tinnitus, a particular form of psychotherapy, cognitive behavioral therapy, has been shown to improve tolerance to tinnitus and diminish the negative impact of tinnitus symptoms," Lin said. "Such patients should be directed to the appropriate mental health care professional who can provide such a service." 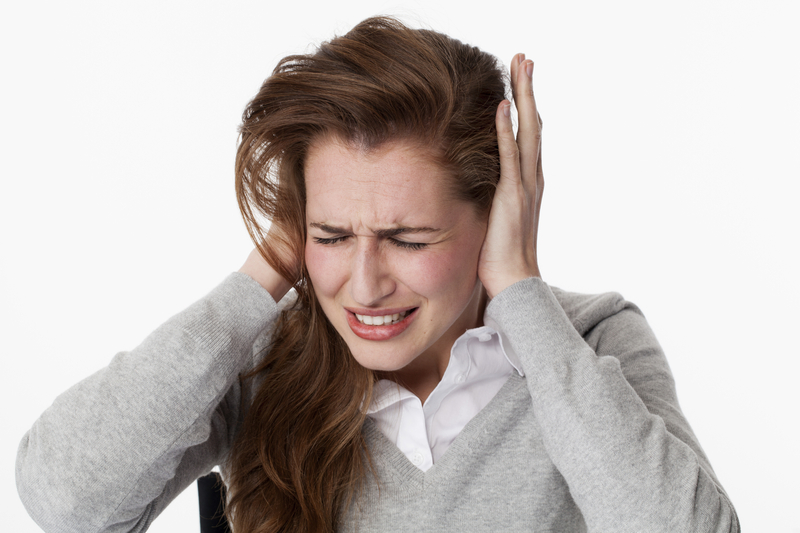 Tinnitus is thought to be brought on by exposure to loud noises. As expected, higher rates of tinnitus in the study were reported in people who were consistently exposed to loud sounds at work and during recreational time. Years of work-related noise exposure correlated with increasing prevalence of tinnitus. Furthermore, Lin notes that those who have served in the armed forces, where they may be exposed to considerable noise trauma in training and in the battlefield, are at particular risk for the condition. While many people just live with minor cases of tinnitus and don't seek treatment, others could greatly benefit from seeing a doctor. Woodson recommends a medical evaluation for people who are experiencing tinnitus for the first time, if it is accompanied by hearing loss, if it is experienced in only one ear, and if it is affecting sleep, mood, or overall quality of life. The study authors say they hope their research will shed light on the need for physicians to more closely follow the recommended clinical guidelines for treating tinnitus, and perhaps educate other health care providers to do so. Woodson said she hopes this study and future research will bring attention to how common the problem is -- and what can be done about it. "I see a lot of patients in my practice who have already seen someone for it and a lot of them say their doctor told them 'there is nothing we can do,'" she said. "But there are a lot of things we can do and I don't think a lot of people are getting that message."